Located in the North Dock of London’s Docklands, between the HSBC tower at Canary Wharf and the residential neighbourhood of Poplar, this garden sits on top of a new Crossrail station (not yet open) and the development above it. The client wanted the garden to create an accessible new shared and open space that would work to unite Poplar and Canary Wharf. The designers based their design on the idea of biophilia (love of natural things) providing a rare space where visitors can interact with nature at high level. The designers overcame the challenges of the depth and weight of soil and the overhead roof structure, turning them into a strength with a design that draws inspiration from the site’s historic use as a place for intrepid explorers in the late 18th Century to unload their exotic plant cargos. A series of reservoirs and staggered terraces at ground level recreate the flood capacity that had been displaced by the building. In 2008, Foster + Partners was commissioned to design a mixed-use scheme encompassing the over-ground elements of a new station for the Crossrail project at Canary Wharf. While the station below this development would be operational only in 2018, the shops, restaurants and roof garden were opened to the public in May 2015. Since the dock was seen as an existing public open space, any new scheme that was built in its place had to include a significant open public amenity, which in this case was the rooftop garden designed by Gillespies. The client wanted to garden to create an accessible new shared and open space that would work to unite Poplar and Canary. The garden needed to be distinctive from the surrounding ground level parks seen across London. The space can appear deceptively simple but this has been achieved through careful and collaborative integration of architecture, engineering, and landscape. 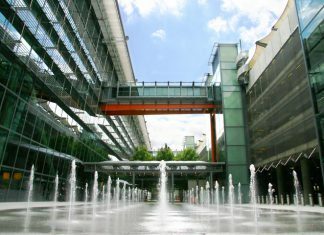 The position of the building – uniquely situated within the waters of the West India Dock - and the timber lattice roof, clearly differentiates this building from others in Canary Wharf. 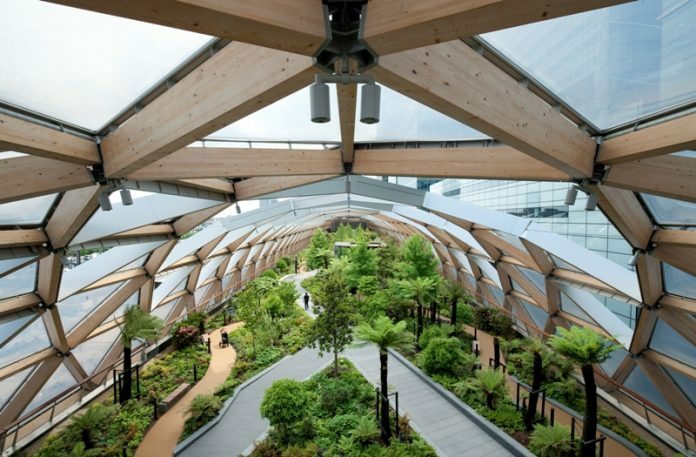 The ETFE air cushions, which are a highly insulating material, create a comfortable environment for all year round enjoyment, as well as a favourable microclimate allowing the use of unusual plant species. The positioning of the garden above a station provided a number of challenges – shallow substrate depth, weight of planting and an overhead roof structure. We embraced these challenges by constructing the garden over a reinforced slab that acted as a wide tray containing enough lightweight soil to support mature trees and plants. To allow for root growth and drainage, footpaths had to be elevated on lightweight supporting structures. A detailed structural grid was developed to govern the positioning of the trees allowing the taller trees to benefit from the large openings in the structure. During construction, all material – soil, plants and trees – was craned through the openings in the roof. The flood capacity of the dock - reduced by locating the building within the water, was kept balanced by creating a series of reservoirs stepped in planted terraces – 200m in length – that lie perpendicular to the dock edge. These terraces are staggered to encourage water circulation and absorb the displaced surface area which would have been occupied if flooding occurred.